How many lives can a hero take before he becomes a villain? Rei Ogami doesn't have a problem with killing. As a Code:Breaker - a super-powered assassin employed by a secret government organization - he works outside of the law, existing in the gray area between right and wrong. When Rei gets an assignment, criminals are cremated in a blaze of blue fire. That is, until a classmate named Sakura witnesses his fatal flames in action and makes it her mission to keep him from killing again. As Sakura becomes entrenched in Rei's world of cruelty, mayhem, and violence, the line between good and evil begins to blur. 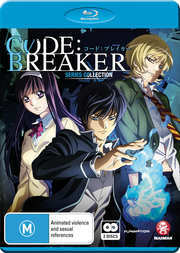 When another Code:Breaker goes rogue and the remaining assassins assemble, murder might be the only way to make things right.